Movistar Yamaha MotoGP rider Maverick Viñales secured a front row start today during a mixed Q2 session at the Phillip Island Grand Prix Circuit, taking second place on the grid for tomorrow’s Michelin Australian Motorcycle Grand Prix. The worsening rainy conditions in sector 4 compromised teammate Valentino Rossi’s qualifying efforts. He secured seventh position on the third row of the grid. Just before Q2, Viñales and Rossi underlined how comfortable they were feeling on their YZR-M1s in FP4, taking second and third place respectively. However, a bit of drama occurred right before the start of the 15-minute shoot-out. Spots of rain meant the track conditions would be considerably different to any of the previous free practice sessions. 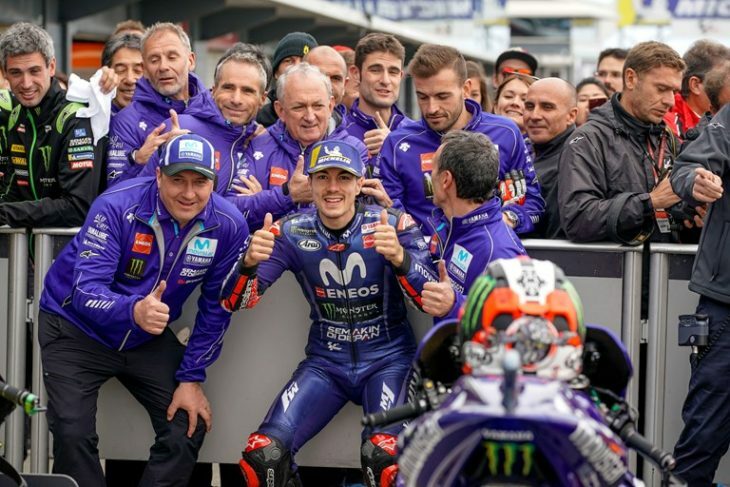 Nevertheless, Viñales was feeling confident that he would be able to put in a hot lap and left the pits a little after the first few riders, to ensure a free track for his first stint. His second flying lap of 1’29.824s left him in provisional third place, before he came into the pits with more than eight minutes to go. The Spaniard leapt onto his other bike and immediately made his way back out on the track, eager to show his pace. The early stop proved to be a master stroke: he managed to clock a 1’29.509s, moving him up from fourth to second place just before the rain became heavier. The number-25 rider had three more goes left as the conditions worsened and even set a fastest first sector on his final try, but he wasn’t able to better his time. He finished the session in second position, 0.310s from pole. Rossi felt confident on his bike in the earlier free practice sessions, but he didn’t have the qualifying session he had hoped for. At the beginning he took some time to warm his tyres after he had left pit lane, allowing the majority of the pack to start their hot laps ahead of him. On his third flying lap the Italian put in a 1’30.270s to slot into sixth place before he returned to the pits for fresh tyres. The Doctor had a quick stop and with more than five minutes on the clock hit the track again. However, just when the nine-time World Champion wanted to put his head down to up the pressure on his rivals, the rain intensified. Unable to better his time, he finished the session in seventh place, 1.071s from first. The Monster Yamaha Tech3 duo did a great job in today’s Qualifying at the Phillip Island circuit. In very tricky conditions, Johann Zarco set the third quickest time of the strong field and will start tomorrow’s 17th round of the 2018 season at 16.00 local time (6.00 CET) from the front row of the grid. Meanwhile, Hafizh Syahrin delivered an amazing performance as well. The Malaysian rookie competed in Q2 for the very first time today and did brave to conquer a stunning 10th position, which takes him to the front of the fourth row, after overcoming a crash in FP3 this morning.